The world must eliminate coal-fired power within about 30 years for any chance to meet agreed climate-change targets. Coal usage is falling in most developed economies. At the same time, developing economies are expanding power generation from coal and renewables to meet the energy needs of their people. With thermal coal exports worth around $25 billion last year, Australia and its coal-exporting regions such as the Hunter Valley need to understand these changes and their consequences. Some facts can be valuable. Globally, there are now about 2,400 coal power plants with about 2,000 gigawatts of generation capacity, double what it was in 2000. Coal generates 40 per cent of the world’s electricity. There are about 270 new coal-fired power plants under construction, representing 200-250 gigawatts of capacity. The overwhelming share of new capacity is being constructed for developing economies. China’s coal fleet grew five-fold between 2000 and 2017 to almost 1,000 gigawatts, and India’s fleet more than trebled over the same period, to more than 200 gigawatts. Together, these countries added close to 50 gigawatts of new coal capacity in 2017 alone, almost as much as Australia’s total installed generation capacity. Yet, these numbers disguise a significant trend. As shown in the chart, as new plants are being built, older plants are being retired. Annual net capacity globally grew by about 80 gigawatts in 2011, but the figure for the yearly increase had fallen to less than 20 gigawatts by 2018. The rate of building coal plants has been slowing even in the developing economies, with concerns about local air pollution adding to their national commitments to emissions reduction. Fossil fuels’ share of capacity growth fell from around 60 per cent in 2012 to 40 per cent in 2017. The world is turning away from coal and the trend is accelerating. Despite the declining trend, coal continues to play an important role in power supply, contributing to a 1.2 per cent increase in thermal coal exports from NSW in 2018. These exports grew steadily from about 100 million tonnes in 2008 to about 170 million tonnes in 2015, but they have been flat since then. The strength of these exports underpins the Minerals Council’s confident statements on the future of coal. These contrasting developments provide ample material for selective data gatherers to ‘prove’ that coal is still king or that coal is on the way out. But the trend clearly supports the latter, albeit at an unknown pace. The International Energy Agency says the rate at which global governments commit to the spirit of the Paris Agreement will determine whether global coal demand stays flat or falls by nearly two-thirds over the next 20 years. Australia needs to make its own decisions on how quickly we respond to this trend. We have little influence over the global trend, but its implications for our export coal revenues are existential. That is the lesson from the numbers. The complement to the transition away from coal is the transition toward lower-emissions power generation – basically solar, wind and hydro. This shift presents a range of challenges and opportunities. In 2017, the Finkel Review recommended a Clean Energy Target as a policy to meet the Coalition Government’s target of a 26 per cent reduction in electricity sector emissions by 2030. This policy would deliver 42 per cent renewable electricity by 2030 on a pathway to zero emissions by 2070. Current federal Labor policy is for 45 per cent emissions reduction and 50 per cent renewable energy by 2030, with a 2050 target of net zero emissions. At that level, the 2030 difference between Labor and the Coalition is remarkably small, given the vitriolic debate of the past decade. During this same time period, existing coal-fired plants will close. The rate of closure will be determined by policy and the economics of solar and wind generation, backed up by storage, natural gas and demand-response, which means adjustments in use by consumers. Precise forecasting is a bedeviled task. But, as with demand for coal exports, the domestic trend is clear: coal looks destined to be replaced by solar and wind generation over the next 30 years. The timing is less certain for the export market. For the Hunter Region, the first stage of grief is to acknowledge these uncomfortable facts and trends. It then becomes possible to plan for a future less dependent on domestic coal use and on coal exports. The worst outcome is illustrated by the impact on jobs and the local community in Victoria’s Latrobe Valley when the Hazelwood power plant shut in 2017 with only five months’ notice. The good news is that the trends for the Hunter region, for both domestic and international demand, allow plenty of time to adapt with the support of governments. That time should not be wasted. 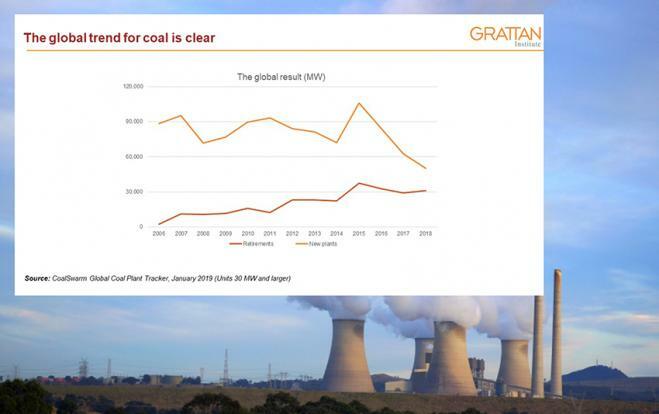 Tony Wood, Energy Program Director, Grattan Institute, spoke at the HRF Centre's Upper Hunter Economic Breakfast on 10 April, 2019. This opinion piece was published in the Newcastle Herald on 5 April, 2019.